Hydrangea Penny Mac is a great introduction by Penny McHenry the founder of the American Hydrangea Society. A Hydrangea macrophylla or big leaf hydrangea, this smaller flowering shrub hydrangea that matures within the 4 to 5 foot height range, but can be kept pruned for smaller spaces. The Penny Mac Hydrangea is a faster growing hydrangea bush that is also disease resistant for many years of growth and flowers. Your soil's pH will determine whether your Penny Mac Hydrangea Shrubs bloom pink or blue. Here are some tips on creating the color you prefer. 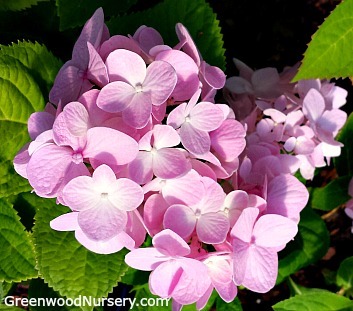 For Pink Hydrangea blooms: A pH of 6.0 to 6.2 is needed. Add dolomite lime several times a year. Recommended: High Phosphorus fertilizer (ratio close to 25/10/10). This will help to limit the amount of aluminum being absorbed by the plant. For Blue Hydrangea blooms: A pH of 5.2 to 5.5 is need here. I have read that a solution of ½ oz (1 Tbsp) aluminum sulfate per gallon of water applied to plants, which are at least 2-3 years old throughout the growing season, will produce blue blooms. Water well before applying the solution and be cautious in applying, as too much can burn the roots. Use a low Phosphorus fertilizer such as a ratio of 25/5/30. Bone should be avoided when attempting to change the color to blue. A natural way to encourage the color change in hydrangeas to blue is to apply organic matter to the soil such as coffee grounds, fruit/vegetable peels, grass clippings and other items you would normally add to compost.